Do you feel like you own enough stuff? When the holidays come around, do you feel the need to say no to material things? If the idea of drowning in frivolous gifts irks you, you are going to love these 40+ zero waste gift ideas that aren’t stuff! Of course, not all ‘stuff’ is bad. Far from it. Offering meaningful or useful material gifts, like houseplants that clean the air, a homemade tincture for anxiety, a secondhand book, or bamboo toothbrushes are all beautiful gift options. In fact, I offer many of these low waste gifts myself over the holidays and even make my own homemade bottle toppers to offer local wine as gifts! But, if you’re also looking for experience gifts and non-material gifts, you’re in luck! There’s an abundance of gift choices that aren’t made with finite environmental resources and don’t require being physically held in your hand. These presents will be truly appreciated by your loved-ones and many will generate wonderful memories! Classes and workshops – If your loved-ones have an insatiable curiosity for life, they will love any opportunity to learn & grow! Consider gifting in-person classes for dance, improv comedy, music, vegan cooking, permaculture, fermentation, foraging, herbalism, pottery, art, or another exciting topic! An online course – I am a huge fan of online courses! Consider gifting Permacrafters’ Conscious Cleaning 101 class or Sprouting class. There are also classes out there on women’s sexuality and on foraging. Scope out Udemy for more class ideas. A Skillshare subscription – Sign them up on Skillshare and they can take all the courses they want on a giant variety of topics for the year, from crafts to design, to photography, and more! Click for 2 FREE Months of Classes on Skillshare! Teach your skills – If there’s a skill your family or friends are dying to learn about, like knitting or piano, commit to spending time teaching them! I will be asking my sis to teach me how to make some of her best soup & lasagna recipes! Theater – My family is huge on theater! Grab some tickets to a big show or your local community theater for a memorable time together. Escape Room – Escape rooms are SUCH a blast and great for bonding! If you haven’t heard of them, the concept is simple: you’re trapped in a room and your group has to work together to find clues to escape. This makes a fun family gift that everyone will enjoy! Sporting Event Ticket – If your family and friends are fans of baseball or football, for instance, attending the live event can be a blast! Ice skating or roller blading – Find a local rink near you for this fun family activity that can be switched up based on the season. Rock climbing – If there’s a rock climbing gym near you, this is a daring activity to do with kids, friends, or your partner. Bowling – Who doesn’t love to put on shiny shoes and go bowling? Ok, probably some of you. But you can cheat and put up the gutter guards! GeoCaching – Take your family geocaching! Use the GeoCach app to locate hidden caches around where you live. We had a blast discovering our new home in Basel this way. Movies – For the movie-lovers out there, this is the perfect gift! Organize an Affordable Weekend Trip – The biggest gift my fiancé has given me this year is organizing affordable weekend trips to the mountains. He books the trains, AirBnBs and selects the stroller-friendly hikes. Being swamped with work and mommy duties, it’s been the best gift I could ask for! AirBnB experiences – AirBnB offers more than simply places to stay. You can sign up your loved-ones for fun activities, like an afternoon of martial arts, making hand-pulled noodles, hiking waterfalls, or so much more you could only dream of! Offer the trip of a lifetime – If you’re looking to gift big, consider getting your loved-one an all-inclusive package to go discover the most beautiful places on Earth! REI Adventures offers incredible outdoors experiences for nature lovers. Train pass or bus pass – My fiancé and I made the best investment paying for an annual train pass. We get 50% off all our train travel in Switzerland, which has pushed us to discover places we could only dream of! This is an awesome gift to offer and receive. Winter gym pass – Winter makes you want to stay cooped up. Offer your loved-one a winter gym pass: they will love you for it! 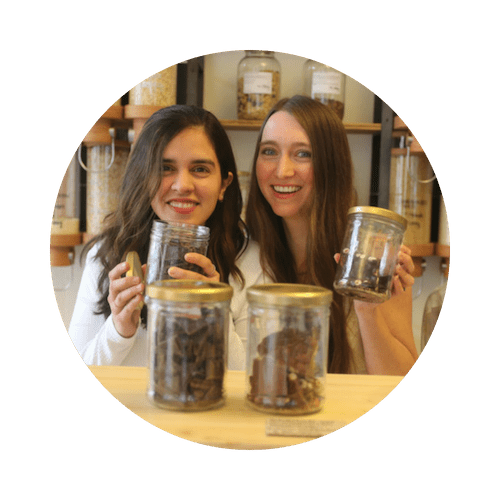 Composting service – Cristina uses CompostNow for her home composting. It’s so simple to compost with a home pick-up service! Consider gifting this amazing service to your family members. Cleaning product refill subscription – Fillaree is a zero waste cleaning shop that offers refill subscription. Sign up your family so they can get safe & plastic-free cleaning products year-round! Local organic produce delivery service – If you want to go big for your gift, consider signing your loved-one up to a local organic produce delivery service. They will receive a fresh box of food to cook up every week at their doorstep. Online news membership – Sign your friends up to annual memberships for news sources such as Permaculture Magazine. They’ll love the abundance of information available to them! Zero Waste Membership – If there’s a zero waste group near you, consider getting membership for a friend of yours, so they can attend the events for the year for a discounted rate or for free! Netflix – This is the gift everyone both loves and hates! (I love you for the endless entertainment; I hate you for fueling my screen addiction.) If you offer this gift, consider sharing a list of your favorite documentaries and movies. Sports club membership – Is your loved-on looking to join a hockey or soccer club? Consider covering the membership fee to entice them to go! Museum membership – If there’s a neat museum near you that offers discounted or free professional development programs with their membership, or access to their online resource library, this is a great gift to give! Annual National Park Pass – Gift the adventure-lovers in your life an annual pass to national parks to entice them to discover the beautiful sights our planet has to offer! Massage – This is my go-to gift for very special people. Getting a massage makes you feel so pampered and loved! It’s hard to go wrong with this gift. Entrance to a spa – Is there a spa with warm baths, steam rooms, and saunas near you? This makes a fantastic gift for someone who needs to unwind. Dinner – Take your loved-one out to a delicious dinner or offer them a gift card for dinner at their favorite spot. Babysitting – Offer to babysit so that your parent-friends can go out on a date and enjoy being baby-free! Meditation class or app – Sign your friend up to a meditation class or to a meditation app such as Headspace. Or let them know about the free app called Insight Timer, where there’s also the option to buy paid classes for them (i.e. Mindfulness for Mothers). Women’s Circle – If your community is lucky enough to offer a women’s circle, where women can tune into themselves and connect with each other, this is an incredible gift to offer. I loved Nadia Setzer’s circle in Chapel Hill. Plant a tree – You can plant one or more trees in their name with OneAction to reforest parts of Northern Ecuador and receive an electronic gift certificate. I used to work here, this startup nonprofit is amazing! Symbolic Animal Adoption – Many organizations invite you to symbolically adopt an animal to protect it. Your niece or nephew might enjoy becoming a Chimp Guardian through the Jane Goodall Foundation or to adopt an African Elephant through the World Wildlife Fund. Note that these adoptions generally come with a plush animal: make sure to ask them not to send the animal if you don’t want the extra “stuff”. Offset their annual carbon emissions – Have your loved-one calculate their carbon emissions for the year with the World Wildlife Fund and offset their emissions. For example, my emissions for 2018 total 11.3 tons of carbon. Each ton equals about $8-10 in offsets. Head to the Carbon Footprint website to choose how to offset the emissions (tree planting, alternative energy, etc.) This gift is a great one to encourage discussion about how to decrease carbon emissions for the following year. Donate in their name – For many years, I have asked friends & family to donate to nonprofits for me in lieu of a gift. My favorite organizations include Conservation International, EarthJustice and the Eco-Institute at Pickards Mountain. Sometimes the smaller actors are the ones that need the most help. Volunteer together – Get your friends & family in on a volunteering activity together! Join a forest cleanup, go plogging together (jogging while picking up trash), help out in a soup kitchen, lend a hand at the gardening coop, or go through your clothes together to donate them to charity. A home video – I am big on memories! Every year, I make a home video of all the best memories from the year. I compile all the videos and photos into a home movie that my fiancé loves! Do you love these zero waste gift ideas that aren’t stuff?! I sure hope this list inspires you to get creative with your non-material presents! Let us know what low waste gifts you will be getting your family this year in the comments below! P.S. If you count on offering stuff too, check out our zero waste gift wrapping ideas! Obtain a yield – Make sure the gifts you offer are truly useful and are actually a gift as opposed to a burdensome object. Use and Value Renewable Resources and Services – During the holidays or when celebrating life events, reduce your consumptive behavior and your dependance on non-renewable natural resources. What gifts can you give that won’t require exploiting the Earth’s finite resources? Produce No Waste – Many of us offer gifts just for the sake of offering gifts, without much thought attached to it. These frivolous gifts come with a high cost to the environment. When gifting, be conscientious of the environmental impact associated to the gift and whether the benefits outweigh the costs. You can purchase gifts that won’t generate any trash and ensure that the gifts are wrapped in reusable materials. So helpful! Thanks for the non-stuff gift ideas! And thanks for the shout out to The Eco-Institute at Pickards Mtn! We are so proud of you! Hi Christelle. Thank you so much for these great gift ideas!